MySpace Launches "My Ads" Self Serve Ad Platform: Is This Their Google Moment? MySpace launches their self serve ad platform, called My Ads, tonight, which was first talked about a year ago. 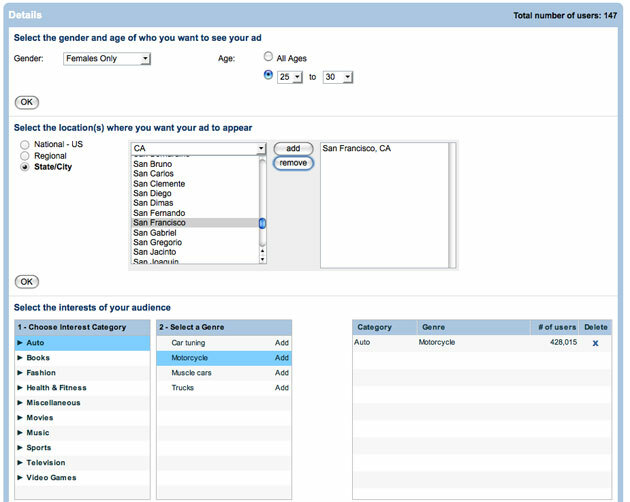 Like Facebook’s similar product, it allows anyone to quickly create a targeted ad and serve it on MySpace. Unlike Facebook, which only allows text ads, MySpace is only allowing display ads for now (advertisers would like both, I imagine). 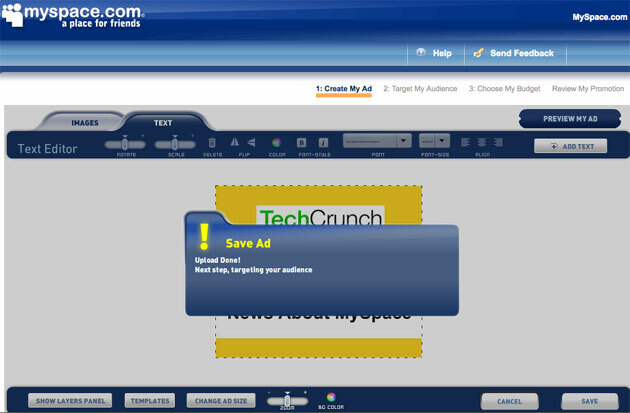 Users can choose between a 728×90 or 300×250 ad unit and can create an ad with pre-built templates and a Flash tool, or upload their own. MySpace ads are charged on a cost-per-click basis (Facebook allows advertisers to pay, at their option, on a cost-per-click or cost-per-impression basis). Ads are prioritized based on the maximum CPC rate stated by the advertiser as well as relative click information – meaning that, like Google, advertisers will pay less if their ads tend to be clicked on a lot. The back end optimization technology behind the product was originally developed by SDC, which was acquired by MySpace’s parent company in February 2007. Will This Be MySpace’s Google Moment? The big social networks are still trying to find their “Google Moment” – the point when (and if) they find a way to monetize these massive audiences they’ve attracted. Google was just a great search engine until they matched it with contextual advertising. MySpace and Facebook need to find their own revenue engine. Facebook will probably only generate $300 million or so in revenue this year. MySpace is ahead of them, with $850 million or so in revenue last year and a projected $1 billion in fiscal 2008 (which ends next June for them). But it’s still a far cry from what Google generates per unique monthly visitor.